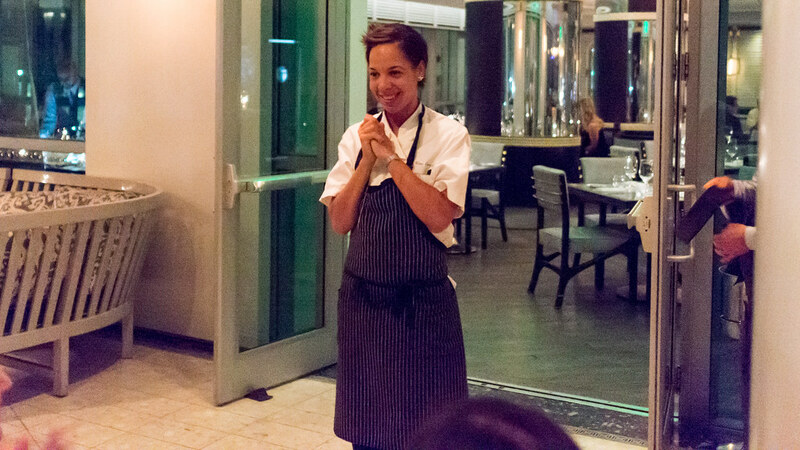 Chef Compton is the self-proclaimed "Gnocchi Queen" but there would be no gnocchi tonight. 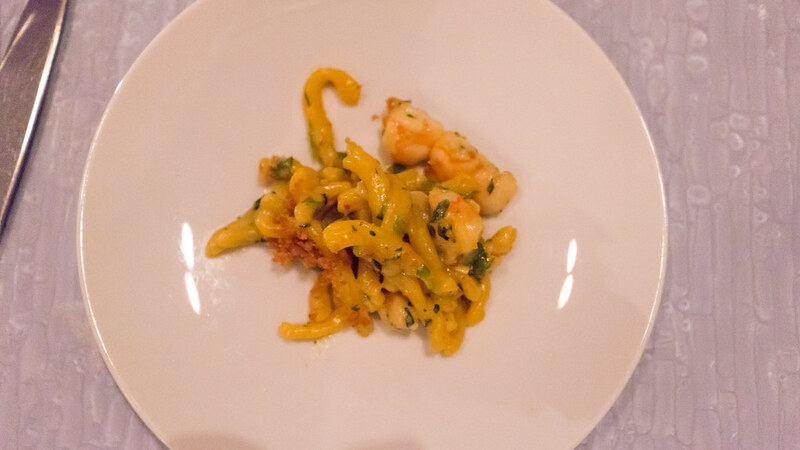 Instead, she served these gemelli, a hearty twisted pasta with a great chew, paired with plump chopped Key West pink shrimp and a ricci di mare (sea urchin) sauce. 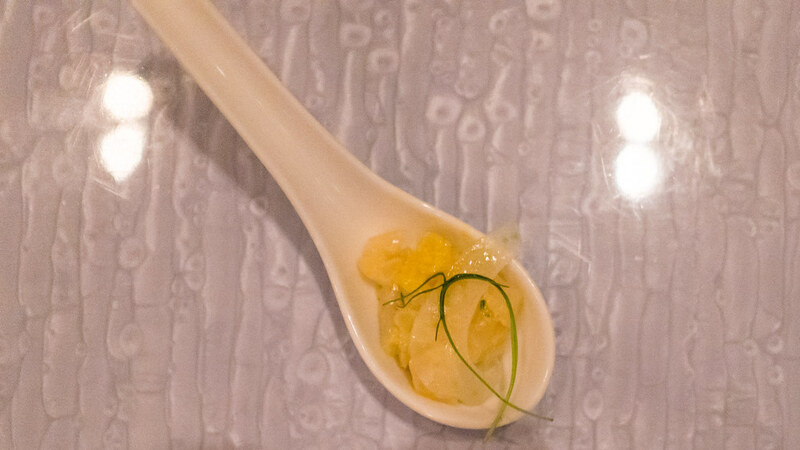 There was a beautiful, deep clean oceanic flavor that permeated the dish (I'm guessing a reduced shrimp shell stock in addition to the sea urchin). Crispy bread crumbs and soft herbs provided just the right contrast in texture and flavor. This was one of the best pasta dishes I've tried all year. Monkfish is known as "poor man's lobster," though the way lobster wholesale prices are plummeting, that may turn around soon. This dish provided further ammunition for giving monkfish top billing. 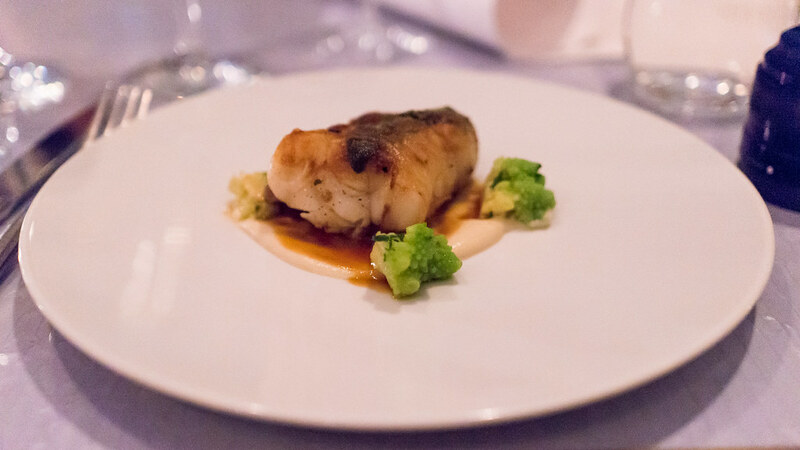 This fish was silkier than most lobsters, with a texture reminiscent of Alaskan sablefish. It was wrapped in lardo, with a sage leaf stuck underneath to perfume the fish as it cooked, in the style of a veal saltimbocca. Florets of romanesco and a cauliflower purée doused with a prosciutto jus completed the dish. An Italian pinot nero for which I again regretfully don't have details was a great pairing for those meaty notes, while still having enough delicacy to not overwhelm the fish. 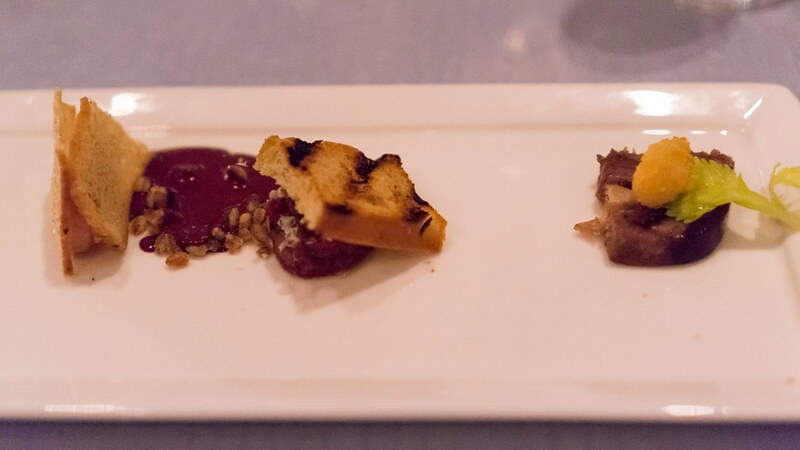 As a final savory course, Chef Compton served a duo of pork featuring a pancetta-spiced loin, along with a confited jowl. 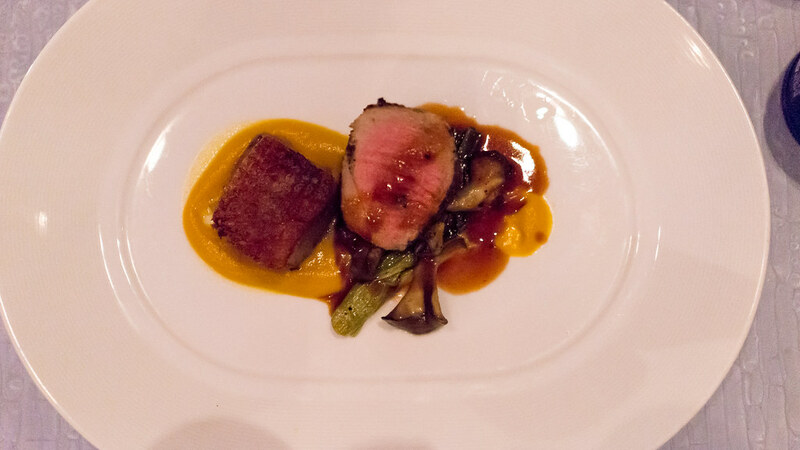 (Top Chef watchers may recognize the pork loin as a variation on a dish Nina served in the "Restaurant Wars" episode, while the sunchoke and black trumpet mushroom accompaniments migrated over to the sweetbread dish). The loin was very good, but the jowl was the star of the plate - perfectly tender meat with a cap of gorgeously crisped fat that just melted away on your tongue. Really beautiful stuff. I'm not usually big on desserts but I really enjoyed this one. 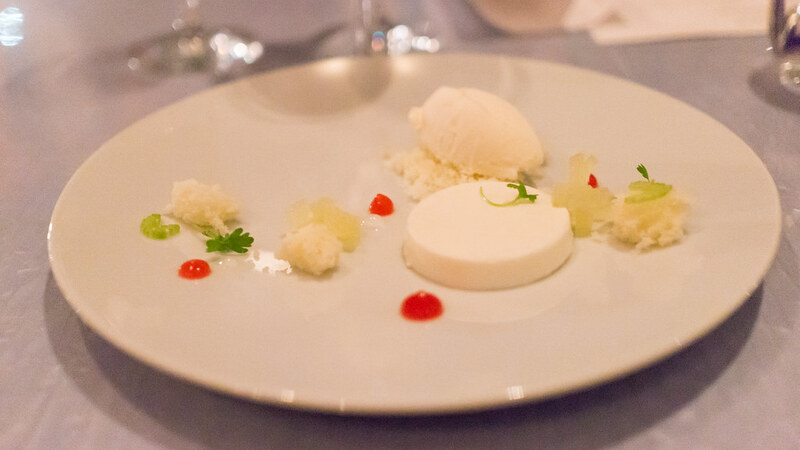 A disk of tangy yogurt mousse was matched with a bright lemon sorbet, airy cake crumbles and variations on apple and celery. Everything about it was light and refreshing instead of heavy and cloying, a great way to finish a big meal. 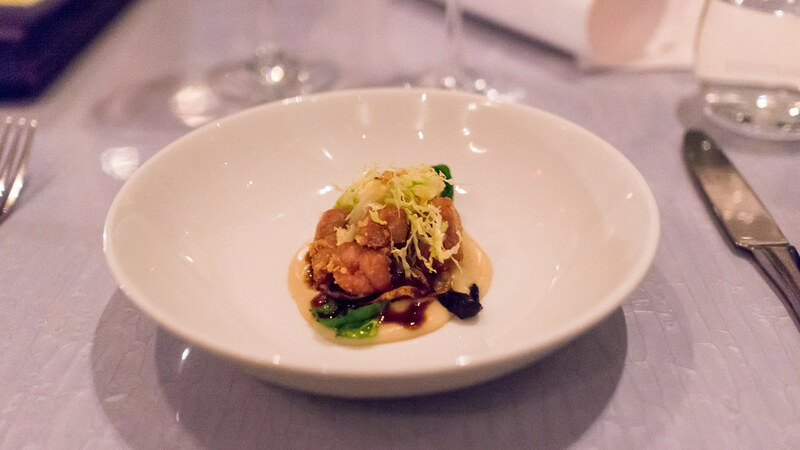 A big thank you to Chef Nina Compton for putting together such a great meal; to all the crew at the Fontainebleau for helping to make it happen; and as always, most of all, to the Guinea Pigs whose interest and support makes these kinds of events possible.